We all know that Cincinnati has great ice cream. We’re very proud of Graeter’s and if friends and family visit Cincinnati this is usually top on their list for places to go. My favorite is their raspberry chocolate chip – yum yum. But, there are so many other fabulous ice cream places throughout the Tri-State and one that I’ve repeatedly driven past but never stopped by until recently is The Cone in West Chester. We’ve tasted The Cone’s creamy soft-serve ice cream before when they’ve visited local festivals in their mobile Cone cart, but having our first official visit to the main Cone was even better. You can’t miss The Cone as you drive along Tylersville Road since there’s a humongous ice cream cone beckoning you to turn in. The big ice cream cone is actually where you place your order. I really like that The Cone is a family owned business and that they actually hauled the big Cone all the way from Florida (click here for more Cone history). 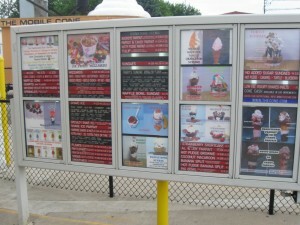 They’ve got soft serve ice-cream galore along with slushies, shaved ice, milkshakes, sundaes and more. There’s plenty of outdoor seating too (just wish they’d put out a few umbrellas at the tables for some shade). I thought my girls would want to get their ice-cream right away but seeing all the kiddie rides pushed their ice-cream cravings aside for a bit. So, our first 25 minutes at The Cone was spent sizing up which rides to do and then putting in $.25 to $.50 per ride for a minute or so of kiddie fun. I say give your kiddos $5 in quarters and let them enjoy. The kiddie ride area is enclosed by a fence and you can sit right outside to watch them. The Cone also has a nice air-conditioned inner sanctum. Here there are also lots of arcade games to entertain the kids. So, if it does get too hot outside, you can always cool off inside. After they played games and rode the kiddie rides, my girls were finally ready for some ice cream. Since I had my Entertainment book with me, I was able to use it for a BOGO milkshake. We got one vanilla (S’s favorite) and one chocolate (K’s favorite). Of course, I had to sample them both and they tasted delicious. You could tell some families were regulars as they were shouting out orders to their parents without even looking at the huge menu board full of ice-cream treats. The big bear drinking fountain was also a hit and it was a nice touch to have small cups easily available so you could fill up with some cool water without having to go back to the counter and ask the friendly staff for one. As I looked around, all the patrons had smiles on their faces – a great sign that they were enjoying their ice cream, each other and The Cone. My girls really enjoyed our visit to The Cone and keep asking when we get to go back. If they ask me for a return engagement, I know it’s a “kid-friendly” winner. Next time, a hot fudge sundae with nuts will be calling my name or maybe I’ll go for the cheesecake on a stick. Until then, I hope you’ll get a chance to visit The Cone and sample some of their delicious soft-serve. Just an updated – on our most recent visit to The Cone, there were umbrellas up so we had some shade. I also tried their orange/vanilla twist – yummilicious – one of my favorite spots for creamy soft serve. A winner! 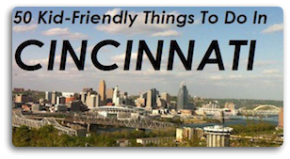 @FamFriendlyCin Hi.I love the way you recognize local small #cincy biz. Im almost ready to start mine up. Can you help me out too? Im broke! This looks like the most fun ice cream shop ever! Zaine, thanks for the info. Never been to Putz’s but now we’ll need to put that on our summer to do list! You have to know about Putz’s Creamy Whip!!! A Cincinnati icon! !